Christmas is in the air! And ON the air! Amidst the holly jolly jingles, I’m bringing my 12 Stockings of Christmas out again and hanging them, stuffed full of incredible prizes, along my fireplace hearth, until YOU have won one of them! Just so you know what will be coming your way if you win (I mean, don’t we all hate to get fun prizes unless we can mentally prepare how we’ll use them? lol) here’s a run-down on a few of my favorite things, that I hope will become your favorites as well! It works like this: On each of the days noted in the list below, I will feature one great product on my show. Text, or use the code word for each product on the Sweepstakes web page, to be entered to win ALL the items on my list. I’ll be giving away 12 sweepstakes packages to 12 lucky winners. You may enter as often as you wish, via the 12 Stockings of Christmas Entry Page, or by texting 48484. Balsam Hill has been the leading retailer of highly realistic artificial Christmas trees and holiday décor for over a decade, and do I LOVE their products! That’s why I’m bringing them back to my 12 Stocking of Christmas Sweepstakes. They have beautiful décor for your year-round needs; fantastic fall displays, signature Christmas trees, elegant ornament sets, flickering flameless candles, and a gorgeous spring floral line. My studio always looks amazing with Balsam Hill décor! I was just visiting the Hallmark Channel and their set is also filled with beautiful Balsam Hill decorations. Balsam Hill have been consistent supporters of my foundation, Point Hope, for the last 4 years, and I’m so grateful. For beautiful holiday décor, you owe it to yourself to visit Balsamhill.com. Shopping for the perfect Christmas and seasonal décor is just a click away! You know what store had been around for over 100 and has set the standard in quality bedding, bath, and décor for your home? The Company Store, that’s who, and I am so excited to welcome them back as one of my sponsors in my 12 Stockings of Christmas Sweepstakes. They carry the cutest FAMILY pajamas, (I just ordered my families) and beautiful holiday décor; they even have great products for your pets. I love everything they have from their down comforters, pillows that are still made in the USA to their towels and sheets. Your family holiday wish list can be taken care of in one click! Have family or friends coming this holiday get ready by freshening up the linens in the bedrooms and bathrooms with beautiful accessories from THE COMPANY STORE.COM. They’re great for last minute shopping because they have guaranteed delivery by Christmas if you order by 10am (ET) December 21st (see website for details). They’ve been all about COMFORT since 1911! Maybe you’ve heard for KING & COUNTRY played on my radio program? You’ve told me how much you love their music and how breathtaking they are to experience in concert. Lucky you, because I’m adding autographed copies of their new CD, “Burn the Ships” http://smarturl.it/BurnTheShipsAlbum and their holiday release, “Christmas | Live from Phoenix.” http://smarturl.it/ fKCChristmasLive. to my 12 Stockings of Christmas Sweepstakes. If you don’t know them you should; their music is both uplifting and spiritual, singing about the reason for the season. (They have the MOST amazing version of “The Little Drummer Boy”) They’re on tour this holiday season and if they come to your town they are not to be missed. You can check out their music and tour schedule at for KING & COUNTRY’s web site. Both albums are available everywhere. I’m welcoming eight-time Grammy nominated TRAIN back to my 12 Stockings of Christmas with, “TRAINS Greatest Hits” https://fanlink.to/traingreatesthits. The new album comes fresh off a sold-out summer tour with Hall and Oats and celebrates 20 years of TRAIN music. It pulls together 16 fan-favorites including “Drops of Jupiter,” “Calling All Angels,” and “Hey Soul Sister” as well as a special cover of a Pat Monahan favorite, George Michael’s “Careless Whisper.” featuring the amazing saxophonist, Kenny G.
I’m also including their wonderful Christmas album, “Christmas in Tahoe,” https://fanlink.to/christmasintahoe that’s filled with holiday classics we’ve come to love. It’s no surprise that TRAIN has had 12 albums on Billboard’s Top 200! Keep them in mind when you’re shopping for the music fan on your list, and be sure and pick up copies of each CD for yourself. . Put a little TRAIN underneath your Christmas tree this holiday season! They are incredible supporters of Point Hope, and I love them! “Everyday is Christmas,” from Sia, is also making it’s way into my 12 Stockings of Christmas Sweepstakes. It’s composed of 10 original songs created by Sia and producer Greg Kurstin. You’ll hear last year’s favorite “Santa’s Coming For Us,” as well as her latest single “Candy Cane Lane”. “Everyday is Christmas” has a song for everyone this holiday season, perfect for your holiday playlist and your favorite persons Christmas stocking. One of my favorites from last year’s 12 Stockings of Christmas, the FUJIFILM Instax Camera, is back! Did you know I use it when I go to Africa for Point Hope? The children love walking away with their pictures in hand. The INSTAX is a great stocking stuffer, perfect for capturing every moment of every special occasion; birthday celebrations, weddings, parties and CHRISTMAS MORNING. Just snap and watch the pictures develop instantly. There are Instax pictures all over my house of the kids, the dogs, and our farm animals too. Put some fun in your holiday stocking this Christmas by sharing an original with Fujifilm Instax SQ6 Square Camera! 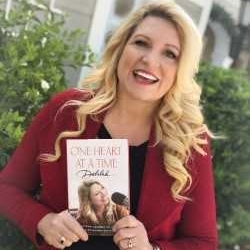 If you’ve tuned in to the show lately, you know I’ve written a new book, One Heart At A Time, released on October 16. It was a labor of love, and became even more so after the loss of my beloved son, Zachariah, the previous year. Writing stopped for a while, but telling his story became such a pressing need that I pressed on, finished the book, and created a new chapter just about him. But the book is more than that. This is my story and my plea. The world is facing some trying times, we are more disconnected and lonelier than ever before. How do we change it? One. Heart. At. A. Time. I’ve included an autographed copy in each of my 12 Stockings this year with the hope that you will enjoy it and it will inspire you to reach out and help me change the world. All we need is love and a heart that is willing to serve. Let me introduce you to something I’ve just discovered, the Gravity Blanket. Are you hosting relatives, cooking over-the-top meals, spending hours shopping for gifts, and feeling that holiday stress? You need a Gravity Blanket! It’s a weighted blanket that’s designed to help improve sleep and decrease stress and anxiety. I gave one to my daughter, Shaylah - baby Rosalie’s mama - and she loves it. A Gravity Blanket is the best gift you can give someone who deserves some rest and relaxation this holiday season and all year through. Buy yours today and use the promo code ‘DELILAH’ for 15% savings. 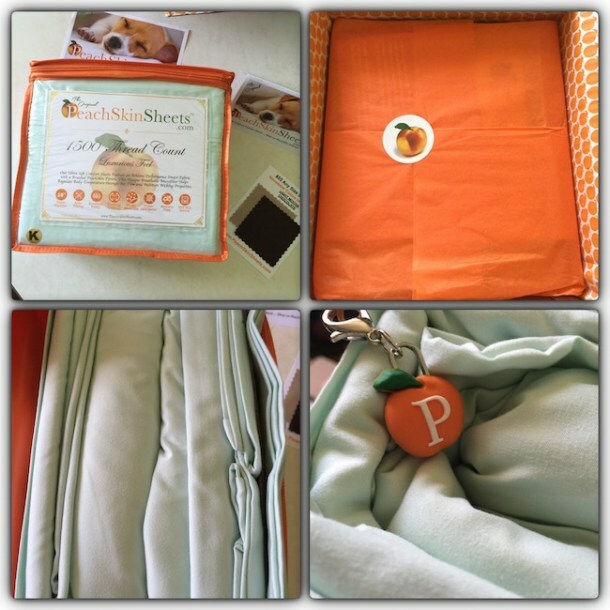 PeachSkinSheets® are made from a breathable, athletic grade, performance SMART fabric that wicks away moisture and dries super fast. These ultra-soft, pill-resistant bed sheets also have a luxurious 1500 Thread Count level of softness due to their brushed PeachSkin finish on both sides. Order free swatches of 19 colors online so that you can Feel to Believe, and purchase with confidence under their 30 day, risk free money back guarantee! I fell in love with the SPINSTYLE last year so it just makes sense to add it to my 12 Stockings of Christmas. The perfect gift, SalonTech’s patented Technology Curl Dial works like an extra set of hands to pick up, separate, and guide hair around the barrel, to create easy, fast, and tangle free curls with one hand (just make sure the hair is brushed through!). From tight bouncy curls to loose, voluptuous, beachy waves at the touch of a button, the SpinStyle takes half the time of a regular curling iron. I do my hair in the morning and I am set for the entire day! I have one for home and one for travel. It makes for the perfect stocking stuffer, and my listeners can get an exclusive, special offer through SpinStyle. New music is the perfect gift for everyone! I’m adding Calum Scott’s amazing debut album to the goodies in my stockings. You’ve heard “You Are the Reason” played on my show, and have seen the heartfelt video on my Facebook page. The entire album is filled with music meant to connect people. Calum is quoted, “I wrote this album with the intention of connecting with people all around the world, using my own personal experiences.” Every song on Only Human evokes wonderful emotion and his videos too are beautiful and emotive. You won’t go wrong by adding Calum’s Only Human to the list of What To Buy for your favorite people this holiday season. I am so excited to add one of the most anticipated albums of the year to my 12 Stockings of Christmas! I’m talking about Steve Perry’s new album “Traces” of course. It’s his first new music in nearly a quarter of a century, and it’s available everywhere NOW. “Traces” is the legendary singer-songwriter’s most honest and vulnerable release to date, chronicling love, loss, and, ultimately, hope. Perry leads with the track “No Erasin” and reassuringly greets fans with the opening line “I know it’s been a long time comin’.” The track is an emotional homecoming; everyone is celebrating his new music. Forbes Magazine exclaims “for all of music it is damn good to have the Steve Perry back.” I couldn’t agree more. My 12 Stockings of Christmas just aren’t complete until I’ve added my favorite candy, Almond ROCA. This delicious treat brings back the fondest childhood memories of Christmas’ past, and I love giving, and getting into, those pink tins all year long! Brown and Haley make every batch of ROCA with rich creamy butter, California almonds, and the best quality chocolate! Choose from Almond, Cashew, Dark Chocolate, Sea Salt Caramel, Peppermint, and Mocha ROCA. SO YUMMY!! They have something for EVERYONE. This holiday season, whether looking for gifts for your office party, your child’s favorite teacher, or sweet treat for yourself, remember, every stocking should be filled with Almond ROCA on Christmas morning. Visit them online or find them at local retailers.